PSNews – Over the last few days, many coastal villages across Quang Binh Province have organized the Cau Ngu (Whale Worshipping) festival in the hope that all local people would have a peaceful and prosperous year and local fishermen would strike lucky when fishing at sea. PSNews - The first ever orchids festival themed "Tropical colours" will take place from April 27 to May 1, at Tao Dan park, Nguyen Thi Minh Khai street, No.1 district, Ho Chi Minh city. PSNews - The Singapore Festival, hosted by the Singapore Tourism Board and the Singaporean Embassy in Vietnam, place on March 23 and 24. Hanoians had an impressive experience of the culture, people and beauty of the lion island nation. Cinderella may be the most popular ballet produced by the HCMC Ballet. Perhaps The Nutcracker rivals it, but that work is closely associated with Christmas. Cinderella, by contract, is a ballet for all seasons. A diverse range of events will take place during the Grape and Wine Festival- NinhThuan 2019, slated for between April 26 and May 2. The Ministry of Culture, Sports and Tourism has applied for UNESCO recognition of the Xoe dancing of Thai ethnic people and the pottery making of Cham ethnic people as an intangible heritage of humanity and intangible cultural heritage in need of urgent afeguarding. Danang authorities and Sun Group revealed the full official itinerary for the Danang International Fireworks Festival 2019 (DIFF 2019), which promises to be a dazzling extravaganza from start to finish. PSNews - The Embassy of Italy in Hanoi in collaboration with the Hanoi Municipal People's Committee and SCE Project Asia, IUAV of Venice held a workshop named "Cities of the future and heritage preservation" on March 20, at Thang Long Imperial Citadel. PSNews - Within the framework of the third Vietnam - Japan Piano Festival 2019, a concert named "Spring of Music and Friendship" will be held on March 20 in Hanoi, with the aim of strengthening the relations between the two countries. 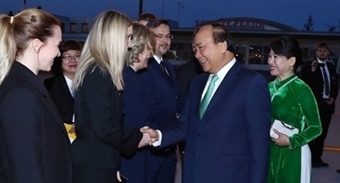 PSNews - A ceremony in response to the Earth Hour Campaign was launched in Ho Chi Minh City (HCMC) on March 17 with the participation of more than 1,000 volunteer youths and two ambassadors of the event - singer Le Thien Hieu and singer Lynk Lee. Angoulême International Short Film Festival featuring movies from France and other movie industries of countries will take place at the Ho Chi Minh City College of Stage Performance and Cinematics on March 18. The five-day exhibition features hundreds of flower works, including those arranged by members of the Ikenobo family, especially the 45th headmaster Ikenobo Senei. It is expected to attract tens of thousands of visitors. With health care and other costs skyrocketing in the US, many soon-to-be retirees are considering what once might have been unthinkable: taking their retirement savings and moving overseas for their senior years.